There are already two cabins at the eastern edge of the fine view property, but this large lot is a prime lakeview site for a large North American-style home. A buyer could live in a cabin while building a prime home on the wide pastured hilltop above. It's located just 10-15 minutes south of the town of Nuevo Arenal on the way to the dam, the volcano and the town of La Fortuna. Electricity and water are already in place. Next to this lot, the owners have an excellent brand-new remodeled 2BR 2BA home for sale for $239,000. See it here. Otherwise, this fine property is surrounded by nature with its beautiful vistas and abundant wildlife. Excellent water is provided by its own spring on which there is a pump house. 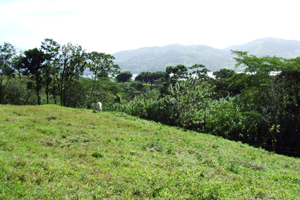 With extraordinary views, expansive buildable areas, utilities in place, easy access from both highway and secondary road, and usable living quarters already on site, this property omits much of the time and obstacles required to complete construction on most of the lots available at Lake Arenal. What's more, there's easy access to the lake through the woods on the other side of the lake highway. One may apply to the lake electrical authority to establish access through the woods to one's own floating dock or moorage. 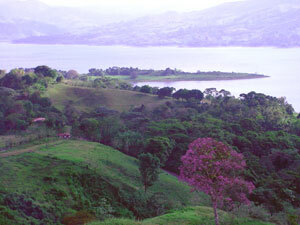 These two views from high above the lot show the visual richness of the fine location Lake Arenal, beautiful and temperate even on cloudy days. The 1.75-acre lot is the distant fairly level area left of center in the left photo. 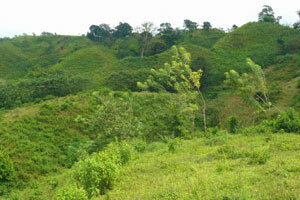 From the pastured area, the lot descends to the Iake highway. The two cabins are located amid the trees on that slope. The lake waters are across the highway less than 200 yards from the cabins. Taken on a cloudy day, our photos do not show the famous Arenal Volcano, which is an imposing presence from this point less than halfway up the approximately 20-mile-long lake. 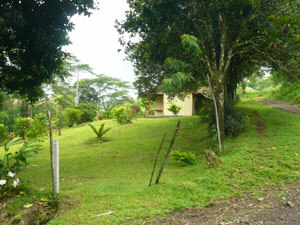 The upper part of the lot has excellent lake and volcano views with excellent access to the extensive buildable area. The lower part of the lot descends a forested slope to the paved lake highway. 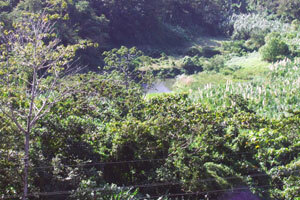 On the other side of the highway, a pretty lake lagoon brings the waters within a few yards of the property. 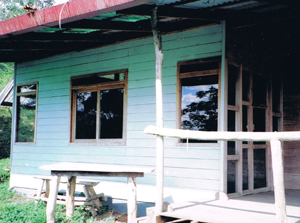 The upper part of the property has a wide, nearly level area very easy to build on. Good water and electricity are present on the lot. From the lot, one can discern in two places the lake road in this photo taken in 2005 before paving was completed on the lake highway. A pleasant lane leads from the lake highway past the two cabins to the wide lakeview pastures above. 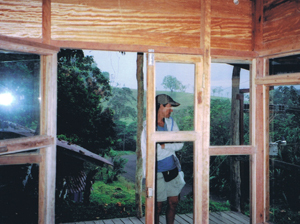 One the the two cabins, El Cipres (cypress), has been remodeled with much additional glass for better views. A view inside the El Cipres (cypress) cabin. The lake comes close in this lagoon below the lot, an easy access of less than 200 yards. 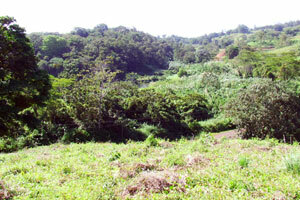 The property is surrounded by verdant hills, providing pleasing 360-degree views. The yellow pin L24 marks the extensive lake and volcano-view area of the lot. Lower down, where its trees border the lake highway, it narrows between the highway and a secondary road as it near the neighboring property, H35, which is also for sale by the same owenrs. The two cabins are amid the trees in the narrow section. See photos of H35 here. 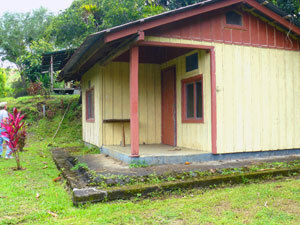 The two properties can be purchased together for $329,000, reduced from $450,000. 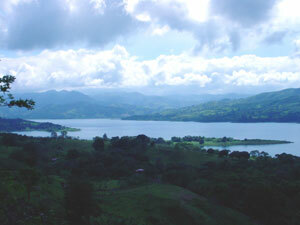 The forest betwen the highway and the water is owned by ICE, the electric authority, which controls the lake, which is an important energy source for Costa Rica.